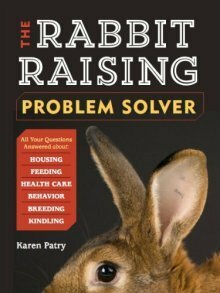 The mother rabbit (doe) knows best about taking care of baby rabbits. Most does can build their nest, kindle their babies, and feed and care for them without a single hitch. Last night I entered the barn to feed the animals. Four rabbits were due to have their litters, but I didn’t expect any activity until very late in the evening. 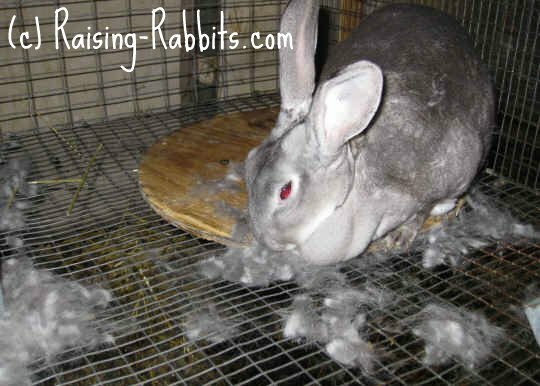 Madrona, a chinchilla rex doe, however, had pulled fur from her tummy and dewlap, and had scattered it all over the cage. She had half-lined the rabbit nest box, and had two more piles of fur outside the box, one pile in front, and another on the side. It almost looked like she was trying to line the entire cage! 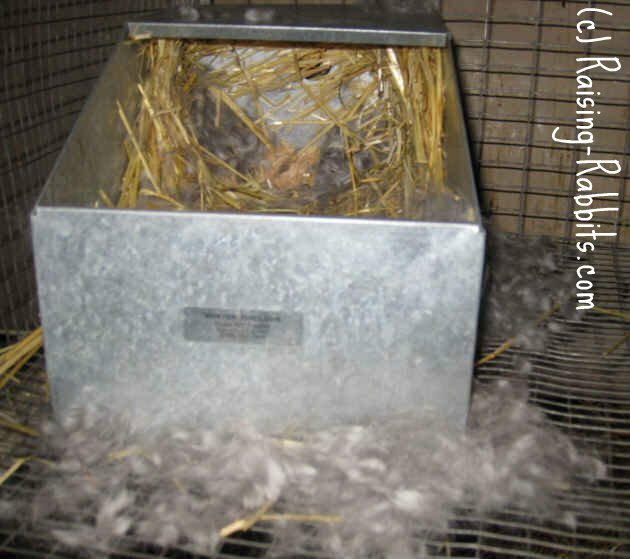 A little more checking revealed six lovely newborn baby rabbits huddled just inside the nest box, with nary a scrap of fur covering them. Given that it was 39 degrees and dropping, I breathed a prayer of gratitude that this doe had given birth early in the evening before I had fed the rabbits and then disappeared into the house for the evening. The kits were still very warm - I had stumbled upon their birth within minutes of kindling. Any other scenario could easily have ended in kits frozen to death. The poor confused doe was trying very hard to take good care of her baby rabbits, but it was clearly time to intervene on behalf of the little ones. I pulled out the rabbit nest box, placing each of the kits deep into the burrow capably hollowed out and lined by the doe. 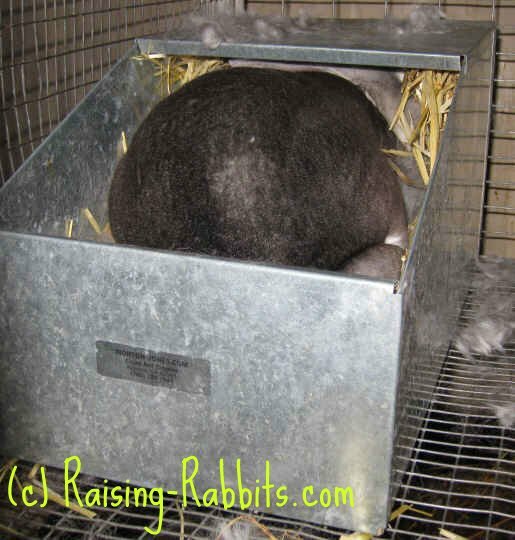 No sooner had I placed the nest box back inside the doe’s cage, than she hopped into the box. All that could be seen for a good 15 minutes was the hind end of her rump, as I assume she was feeding her babies. This was the point at which I turned away and finished feeding the rabbits. A few days later I was back in the barn. 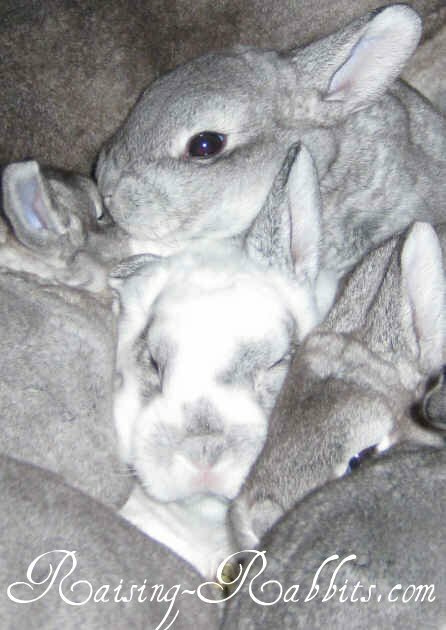 Madrona, the chinchilla doe, was sitting placidly in her nest. Her kits were warm and snuggly, with round full tummies. Yes, she was now taking care of her baby rabbits perfectly. She let me pet her appreciatively. Are you sure your doe is rejecting her kits, or not feeding them enough? Our page on feeding wild rabbits is applicable to very young orphaned domestic rabbits as well. You'll also find help at Feeding Baby Rabbits. Otherwise, do your best to help the doe only if it is apparent she needs the help. Most of the time, the doe is better than humans at taking care of baby rabbits. A tablespoon of black oil sunflower seeds enhances the doe's condition and lactation. Bene-Bac helps to safeguard kits against dangerous diarrhea. Taking care of baby rabbits is so rewarding! Madrona did herself proud. She just needed a little help at the beginning. Here is her litter, fresh out of the nest box 2 1/2 weeks later and doing terrific. They'll be ready to wean in another month.